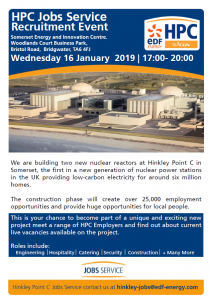 We would like to invite you to the Hinkley Point C Job Service recruitment event, to be held at the Somerset Energy and Innovation Centre on Wednesday January 16th 2019. The event will be held between 17:00 and 20:00 pm. This is your chance to become part of a unique and exciting new project and meet a range of HPC Employers and find out about current live vacancies available on the project. We have a range of employers including G4S Security, Somerset Larder, Wessex Water, Cavendish Boccard + many more Tier 1 contractors with upcoming live vacancies in 2019 on HPC. Should you wish to attend the event, please send confirmation to Hinkley-jobs-events@edf-energy.com before Monday 14th January.